Is E.on's 3.5% price cut the first shot in an energy price war? 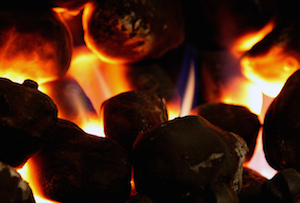 Is E.on's price cut the first shot in an energy price war? Wholesale gas prices may have plunged of late, but energy companies still have to hedge. E.on cut its gas prices 3.5% today, as oil plunged to less than $46 (£30.48), the lowest for almost six years. But is it the first shot in an energy price war, after the ‘Big Six’ companies became everyone’s favourite corporate baddies last winter? Or little more than symbolism as wholesale prices tumble? The price cut, effective immediately, is equivalent to two weeks’ gas use, or £24 off a household’s annual gas bill, E.on said in a statement. Not exactly huge, but certainly welcome for many cash-strapped families. The German energy giant supplies 4.5 million homes, which have 7.1 million accounts between them. It’s a clever move from E.on, with politicians across the party spectrum haranguing firms to pass on the fall in wholesale gas prices – some 30% in the last year. It was also the last to announce a price rise last winter and the increase of 3.7% was the smallest of the Big Six (EDF, Npower, British Gas, SSE, Scottish Power, E.on), even factoring in three of its competitors’ subsequent price freezes. Clearly a 3.5% cut is an order of magnitude smaller than 30%. Companies can’t just ‘pass on’ immediate price falls, though. Large firms buy supplies up to three years in advance and have to hedge against swinging prices. Oil prices, which are closely linked to gas, have dropped 60% since their recent high of $115, but that was recorded a mere seven months ago. If they keep on dropping, and stay put for any length of time, then consumers may really see the impact – and not just at the petrol pump. The ball is now with the rest of the Big Six, who will probably feel forced to follow suit. But, given how far in advance they have to buy up supplies, this will be a skirmish rather than an all out price war – for now. Will the oil price hurt BAE Systems?